Every week, Food52's Senior Editor Kristen Miglore is unearthing recipes that are nothing short of genius. 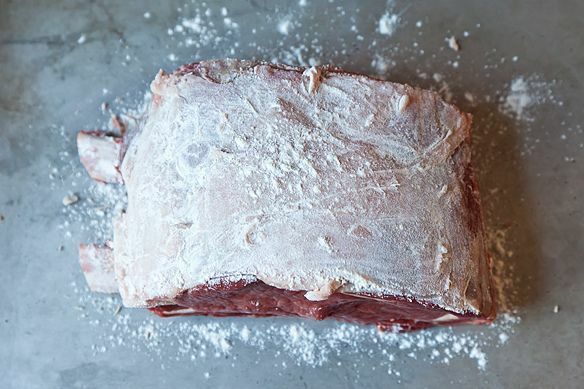 Today: A rib roast that won't let you down, even when you abandon it. I'm really going to do it. Forgive me! 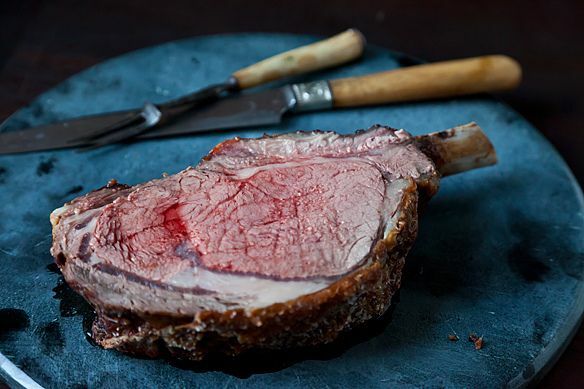 I'm going to compare an utterly genius recipe for rib roast of beef to Angry Birds. I lack the eloquence of Craig Claiborne or Amanda Hesser, who have, in turns, kept this recipe alive and made it legendary. Instead, I'm going for the easy sell. 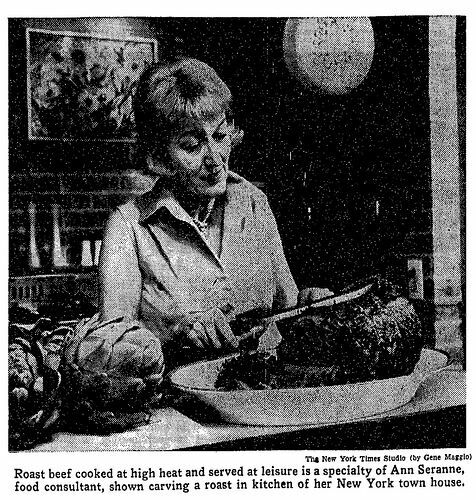 Ann Seranne was a prolific cookbook author, a sometime editor of Gourmet magazine, and the woman responsible for developing this roast beef recipe, which is not only foolproof and perfect in its results, but also is designed to fit neatly into your life and holiday feasting schedule. "Relax." It was both an instruction and a promise in Claiborne's game-changing New York Times article in 1966. Because, aside from a few necessary steps, that's all you can really do. 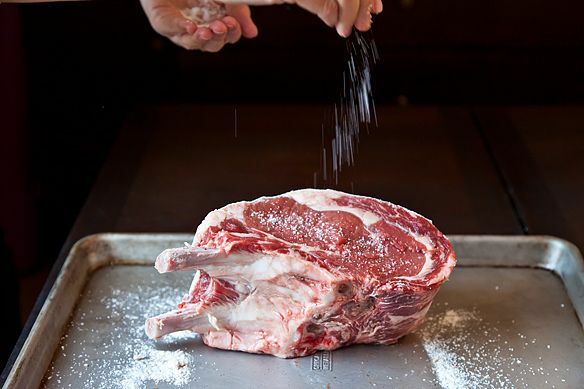 Here are those steps: You should remember to buy the rib roast, and to take it out of the refrigerator in the morning. Then you must massage it with a little flour, salt and pepper (I hope you're not getting too tired). Then -- stay with me -- you'll need to properly read a chart to determine exactly how long to roast the thing at a blazing 500 degrees (5 pounds? 30 minutes.) before shutting off the oven. Then you will have to control yourself not to peek inside for 2 hours. Sound too stressful? Seranne points out you can always go out "for a game of golf or an appointment at the hairdresser." Or more realistically, make your sides and dessert, vacuum, and practice pouring cocktails. You can abandon the roast for up to 4 hours and it will still be warm and ready to serve. Seranne explains, "I've never trusted meat thermometers." Me neither! Her hurry-up-and-wait method is akin to releasing a slingshot, or getting a running start before you hurtle down a slip 'n slide, or, with a flick of a finger, sending an angry little bird arcing toward a tottering house full of pigs. But imagine doing all those things with a sensei guiding you, so that you'll never miss your mark. Seranne is that roast beef sensei. As Amanda explained in her Recipe Redux column from earlier this year, this roast is so delicious not just because it's perfectly cooked, but also because the blanket of flour crisps up into an unbelievable crust. It mimics the classic technique of dredging things in flour, salt and pepper before frying (which I'm pretty sure my grandmother used on every piece of meat that ever wandered through her kitchen, with great success). But frying a roast would be dangerous and not genius. 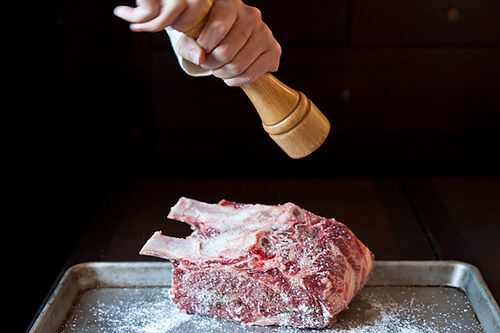 Sizzling a flour-dusted fat cap of a roast at 500 degrees? Genius. I recommend that you read Claiborne's and Amanda's stories in their entirety too. 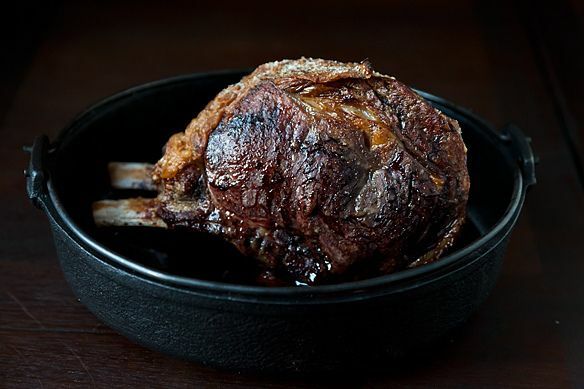 You'll get to see a modern adaptation of the recipe using dry-aged ribeye and panko, and learn that Seranne was also a devoted breeder of small dogs. It's sad to think that, unlike other cooks who were catapaulted to fame by Claiborne (like Marcella Hazan and Paul Prudhomme), Seranne is rarely talked about these days, other than in the context of this recipe. Just imagine the gems lurking in all those back issues of Gourmet, in all the books she wrote -- from the revolutionary and grand (1,001 Ideas for Parties, Fairs and Suppers; Good Food without Meat) to the banal but surely useful (The Complete Book of Freezer Cookery). Let's all try to find those gems, shall we? Next time you see a book by Seranne at a dusty antiquarian cookbook store or on your mother's shelf, crack it open. You can play Angry Birds later. Got a genius recipe to share -- from a classic cookbook, an online source, or anywhere, really? Please send it my way (and tell me what's so smart about it) at [email protected]. I used this recipe, including the letting the roast sit out 3 or so hours beforehand, and I have never tasted anything so perfect! I started with a dry-aged, amazing "happy cow" roast ($30/lb.) I'll make it every Christmas now. Made this for Christmas dinner on Sunday. It was super-easy, turned out fantastic, amd totally stress-free so you can focus on the sides, something I always struggle with. The crust on top is terrific. Great idea and great timing with this, thanks so much. So easy you can do it while tending to a 3-month old! Simple, flawless, genius. I'll never cook rib roast any other way. I made this on Christmas Eve and it was a hit! I loved not worrying about the timing of it....I could concentrate on the sides and salad while the roast was in it's "turned off oven phase". No thermometer to fuss with, no predicting when the roast would be ready. It was perfect! I am hooked! Thank you for sharing this. Merry Christmas! I'm killing time during the 2-hour cool-down and clicked on the links to Craig Claiborne's original article, as suggested. Unfortunately, it only took me to a fragment of a facsimile of the original, so I couldn't read the whole thing. Maybe the text is in the NYT online archive. I think you may need to be a New York Times subscriber (and signed in) to get access to the full article. Hope you enjoy the roast! Okay, I have a five rib roast at 12.6 lbs. I assume this will still work, just add time to the cooking? Or should I whack off a rib? Yes, I think you'll still be fine with 55-60 minutes -- the bone will actually help conduct heat into the center, so I wouldn't add time. Hope you enjoy it! Thanks for this info - and on Christmas Eve, too. Very much appreciate your response. I'm experimenting with everything this year, so why not the roast, too. Merry, merry. the link to the recipe is no longer working! help! i need it for tomorrow! It's working fine for me -- maybe the site had a momentary hiccup. Try refreshing the page and if it doesn't work, let us know! After I read this recipe and saw the pictures, I ran out and bought a 4.79 lb rib roast with 2 ribs. I will never cook a rib roast any other way from now on. It was crispy, crunchy, salty, savory crustiness that was perfectly medium rare on the inside. AND I personally loved the end cut! Au jus, sauteed mushrooms and cauliflower au gratin, and it was a delightful meal! This is a real old-timer. If you have never trusted a meat thermometer, get a Thermapen. It will change your life. 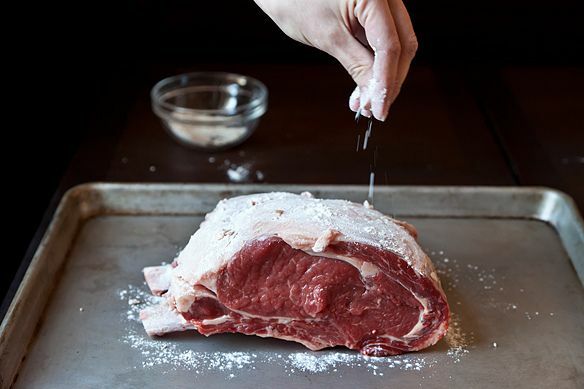 I have used this method, with a lowlier Cross Rib Roast and it was really delicious, perfectly cooked (medium rare and medium) and totally easy!. This recipe looks delicious but it's gluten free since it contains flour. Is there a substitute that would be gluten free but still have the yummy crust? 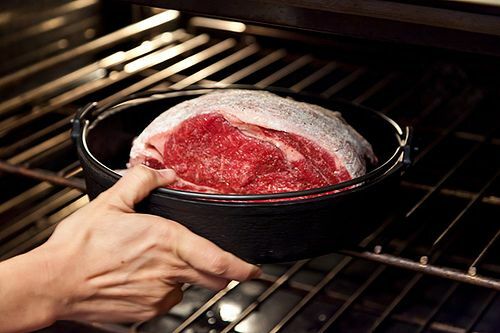 I am making prime rib this year, but my mother-in-law insisted on buying it...which means I am guilted into to cooking it how she likes it, which is well done. Does anyone know if this recipe will get me any well done pieces? Please say yes, I love the no-fuss idea of this recipe. Does your mother-in-law like the end piece? That should be done enough for her (and she'll get lots of the delicious crust, so hopefully that will keep her happy!) but any middle slices won't be. Or maybe you could just throw a slice back in the oven for 15 minutes or so for her? Never thought to flour the meat. I always rub it with Dijon and seasoned salt. Great point ninadora -- in one version of the recipe published by Seranne, she talks about this, and explains how to tell if your oven is well-insulated (if it gets very hot to the touch, it isn't). I'll add that note to the recipe. 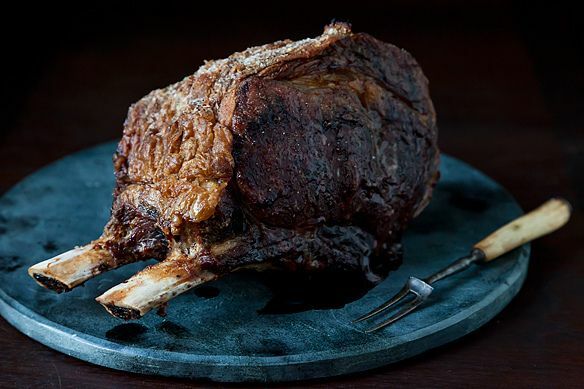 Would love to cook such a beautiful and simple roast, but is it really safe to have that meat sitting out at room temperature for maybe 6 or 7 hours, then flashed on the outside and then gradually heated to no more than 130 in the interior over an additional few hours? We use raw eggs in recipes and eat carpaccio -- but this recipe makes me nervous. Hope you can reassure me! Hi chezmom -- the recipe actually recommends pulling the roast out of the fridge only 2 1/2 to 4 hours before roasting, and yes, I do think it's fine -- not much could survive that blast at 500!